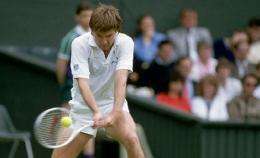 (PhysOrg.com) -- Fans may think of Jimmy Connors as an "old school" tennis player, but according to a new ranking system developed by a Northwestern University researcher, Connors is best player in the history of the game. The rankings are published in PLoS ONE, a journal published by the Public Library of Science. Male tennis players who played in at least one Association of Tennis Professionals match between 1968 and 2010 were evaluated through network analysis, said Filippo Radicchi, author of the study. Ranking tennis players is a novel way to show how complex network analysis can reveal interesting facts hidden in statistical data, said Radicchi, a physicist and postdoctoral fellow in the chemical and biological engineering department of Northwesterns McCormick School of Engineering and Applied Science. Radicchi ran an algorithm, similar to the one used by Google to rank Web pages, on digital data from hundreds of thousands of matches. The data was pulled from the Association of Tennis Professionals website. He quantified the importance of players and ranked them by a tennis prestige score. This score is determined by a players competitiveness, the quality of his performance and number of victories. In this particular ranking system, its more important to win a single match against a very good player than many matches against not-so-good players, said Radicchi, who conducted the research in the lab of Luís Amaral, professor of chemical and biological engineering at the McCormick School. One of the reasons Jimmy Connors ranks on top is because he played for more than 20 years and had the opportunity to win a lot of matches against other very good players, Radicchi said. He expects current greats Roger Federer and Rafael Nadal to eventually move up in the rankings if they face tough competition and continue to win matches. Radicchi, a lifelong tennis fan, plans to run this study again in 10 years to see how the rankings change. Researching and ranking sports stars gives a glimpse at the power of complex network analysis. It also demonstrates the weakness of network analysis: you can basically arrive at any result by tweaking the weight parameters. E.g. Google recently tweaked their parameters and now the search results are radically different sometimes. ... as the most important aspect of being 'best'? Can't take any tennis GOAT ranking seriously that puts those top 3 players above Federer or Nadal. Surely whom you have to compete against must bear more weight than one's win tally. Tennis is ever evolving, and technique has really improved. Well, such scores mean how they'd rank had they had today's training and equipment, against today's players. Fillipo Radicchi has his head too far up his fundamental oriface to be able to see anything. This is a wonderful article, just poorly titled. Determining who is the best player of all time is of course impossible. We can't magically assemble all these great players at the peak of the powers and have them play a metaphysical grand slam. And of course we can argue endlessly about who would beat whom without ever settling the matter. But the reality is that ranking is an integral part of the game and a somewhat arbitrary procedure. Why assign 2,000 points to a major instead of 1,500 or 3,000? That is a subjective judgment call by the people who run professional tennis. But rankings matter big time, because they determine seeding at tournaments. Radicchi offers an alternative, arguably less subjective (though not completely objective), ranking procedure that has been used in a variety of other ranking contexts (such as web page searches). Sadly, Radicchi's procedure can't replace the current ranking system since it is not simple enough for most tennis fan to understand.